Summer 2016, Young Hearts Boarding High School. Anshika describing how she heard about UWC Scholarships from me as a scholarship student at Little Angels, her experience applying for the scholarship and going through the selection process, and her first year experience at UWC Armenia. She is a graduate of Young Hearts. This is a story about the fulfillment of hopes and dreams! In the nineties, when it came to UWC scholarships, I had wanted, firstly, to get students from schools other than St. Xavier’s and St. Mary’s to apply for them, and secondly, to make it possible for those from my kind of socio-economic background to avail themselves of the opportunity. Returning to Nepal in 2013 I was able to do all that. And in 2014, I had hoped that someday we would send a Dalit student to a UWC. That is happening this year! In the nineties, Nepal used to get just one to three full-scholarship offers every year. Who won them however was based entirely on merit! Forget graduates of public schools and from low socio-economic backgrounds, the chances of those who didn’t attend St. Xavier’s or St. Mary’s and did not come from privileged background getting the scholarship was small. As far as I was aware, students at most other private schools were not even aware of the opportunity, forget about students at public schools. The committee was headed by Fr. Donnelly in the beginning. Then — if I remember correctly — briefly by Fr. Brooks, and then by Fr. Watrin. All of them had stints at St. Xavier’s as teachers, and therefore were closely connected to the two schools. Hence most UWCers coming from them, including myself. The entire national committee consisted of just four or five men. All of them, as far as I knew, were middle-aged men with full time jobs etc. I doubt they did — or could do — any outreach work. Graduates could have, but there had hardly been any in the country. In the Summer of 1997, when I returned to Nepal to live and work for the first time in nine years, I saw an opportunity to change that. After graduating from Grinnell College and working a year each at three different United World Colleges, I had deferred — for a year — my enrollment at Columbia University in New York and come home. I ended up spending a year and a half in Nepal, going to Australia in February 1999 for my teaching degree, returning to Nepal the Spring of 2000 and then resuming — in the US, in January 2001 — my teaching career. 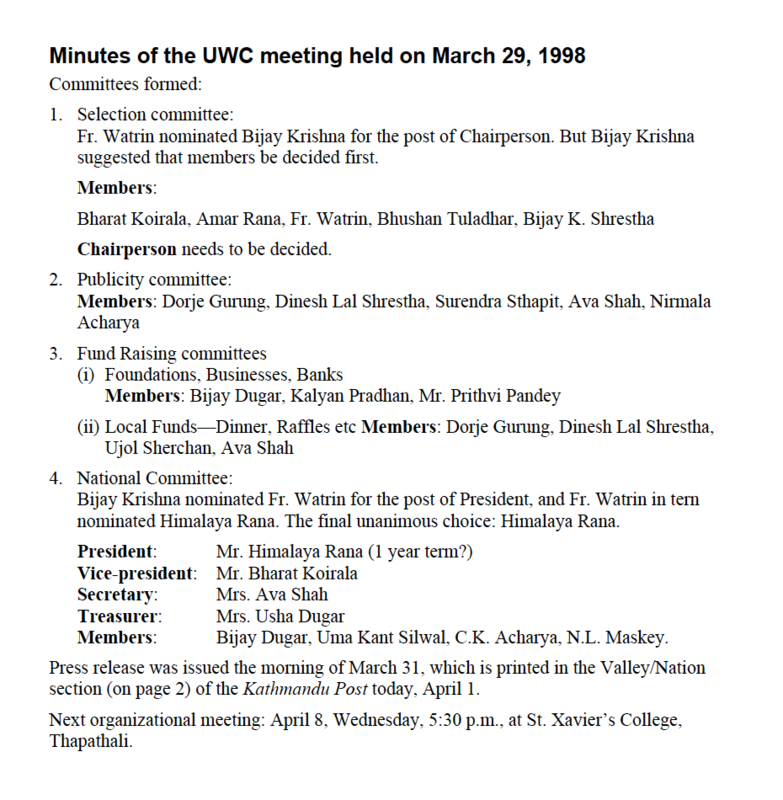 During my time in Nepal, to begin with, I was part of the group that started the process of revamping the Nepal UWC Committee. (See image below for the details.) Until then, as far as I knew, the National and Selection Committee were one and the same small group of people. By the end of the process, we had four different committees: a Selection Committee, a Publicity Committee,a Fundraising Committee, and a National Committee. The publicity committee, of which I was a member, produced a pamphlet about UWC and UWC scholarships, for example. I don’t remember why, out of five of us, only one graduate, Bhushan, was part of the Selection Committee though. One of the reasons behind the revamping had been to raise funds and help support candidates who might be strong but lack the marginal but necessary financial backing. I am having a hard time remembering how much of that actually happened when I was involved in the committees before I left for the US. I don’t know if or how much of that happened after that either. Not long after arriving in Nepal, I also did, on my own, some outreach work. I talked to students at Bhanubhakta Memorial College, Xavier Academy, and Little Angels Colllege, schools I was associated with as an employee of Nepal Education Foundation (NEF). NEF oversaw the three institutions. I don’t remember if any student from those schools applied for the scholarships though. In the Fall of 2000, working at Rato Bangala School, I made presentations to the students about UWC’s. That produced my first result: Robin Piya ended up winning a scholarship to UWC-USA! The next time I returned to Nepal, in May 2013, the main reason had been to contribute towards the education of the marginalized. Not long after arriving back, one of the things I decided I would do to that end was to go back to doing, as a member of the Selection Committee, what I had always felt we should do: promote UWC among students from marginalized backgrounds, possibly inspire them to apply, and make it to UWCs! Incredibly luckily, not long after my arrival in the country, my dream of helping marginalized and/or poor students win UWC scholarships was realized. The criteria of suitability for UWC was changed from “totally merit-based” to “potential-based.” That allowed us, the Selection Committee, to ear mark full-scholarships for students from poor families, or for graduates of public schools. We were even able to use a slightly different selection criteria. Forget about having an extensive experience and accomplishments in extra-curricular activities, graduates from public schools had so little experience with computers that many didn’t even know how to download the application forms from the internet, for example. 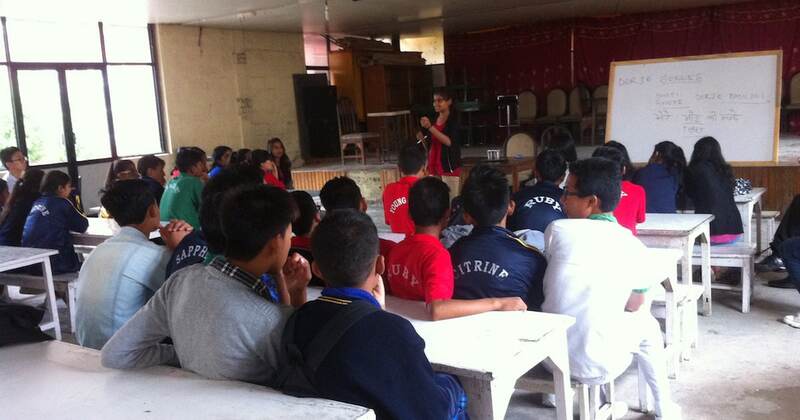 The following is a list of schools in Nepal that I have gone and presented at so far. I have reached about 800 students in total. I have three reasons for speaking at private schools. The first reason is that some of them have scholarship students who are from marginalized and/or poor background. The second reason is that I am also interested in inspiring young children in general to dream and imagine a life they might have never imagined. Finally, I am interested in educating them on the issues the disenfranchised in the country face. I have also had informal sessions with students at two other public schools. The first one Dolagiri School in Changu Narayan is one where COMMITTED has implemented a few projects. The second one is Jana Uddhar, a collaborative school that my mate Pete Pattisson manages. I have volunteered there as a science teacher educator. Unfortunately, I failed in my attempts to reach out to more public schools. The level of success I had with inspiring young children to dream big and apply for UWC scholarships have been mixed. Student from private schools were more likely to apply and they did, like the Rato Bangala School students early this century, Robin’s cohorts, and more recently those at Little Angels. I wasn’t very successful with public school students however. One of the issues is getting the teachers and administrators on board because applicants need a lot of guidance and support from them. With applications for other scholarships or similar things in Nepal, the practice is for the applicant himself/herself to complete even the recommendation forms etc. and the concerned individual to just sign it because, in many cases, all of that is just a formality. That doesn’t work with us, with the Nepal UWC Selection Committee, because we inspect the applications really closely and thoroughly. We are able to identify that easily, and when we do, we disqualify them. The other is our culture of corruption and nepotism, where those with means and/or connection (“source-force” in local parlance) are able to avail themselves of such opportunities. I wouldn’t be surprised if most poor students and/or those from marginalized backgrounds believe that they really have little to no chances because of their lack of social capital. Anyway, after my first presentation in Nepal since my 2013 return, at Little Angels in November 2014, we had many applications. And, one of them, Anushika (see image at the top), won one of the full scholarships that year. In contrast, after my first presentation at Shanti Nikunja School (to about 22 students around the same time), none of their graduates applied. It was the same story with Dolagiri School students. I had talked to five students there, had even talked to the principal, and provided them the application forms. None of that helped, unfortunately. At Jana Uddhar, however, because my mate ran the school and recognized the opportunity for what it is, he assigned a teacher to guide and support the students. All five students I talked to applied! After the second time around at Shanti Nikunja School, I tweeted about it expressing the opinion that “if only one applies and gets an offer, so much could change!” After all, most students at the school are domestic workers themselves or a child of one. They are therefore very poor and many come from broken families. This time around, one did apply AND won a scholarship! He impressed all of us involved in the selection of full scholarship candidates. I celebrated the occasion…with a tweet! When he took off in the Fall of 2017, as far as I know, we sent the first openly gay Nepali boy to a UWC. That, personally, was another reason to rejoice! One of the finalists for the full scholarship the first year (in 2014) we implemented the potential-based selection process was a young Newar Dalit girl from Bhaktapur. Talking about role models in the UWC Scholarship Fundraisers page, I had expressed my disappointment with our inability to also send her. In the same page, I also expressed the hope that we would send a Dalit student to a UWC soon. As far as I am aware, not a single one of the UWCer until then or the two hundred or so to date, has been a Dalit. They constitute around 12% of the population (see image below). Dalits, if you didn’t know, are the lowest caste in the Nepali social system, the caste system, and suffer greatly because of that. Turns out, we are sending one this year! I wasn’t involved in the selection though I did publish a blog post about it. The icing on the cake, so to speak, is the fact that the scholar is a graduate of Jana Uddhar, the school my mate Pete runs, the school where I volunteered as a science teacher educator, and the school I first introduced the UWC scholarships to and got five of their students to apply some time ago! Again, I rejoiced a little in that, even making a post about it on Facebook. So, of those who I had hoped were inspired by my stories, three have made it to UWCs and one, a Dalit, from a school I introduced the UWC to is heading there this Fall! My hope is that that has had or has the impact on their community my going abroad for studies had on mine. Like Country, Like Young Man?